Lowering your center of gravity. Another physical statement - lowering the center of gravity and making the bulk of your body neutral to the chassis of the motorcycle. What a theory - and who can argue it? Well, just about everyone I have ever worked with has - not intentionally - but by their riding behavior! I can only think that most of us learned to ride a motorcycle by pushing a wheelbarrow as kids doing yard work. This concept has no meaning when we are cutting a hole on the wide open interstate but the moment a direction change comes to play, it is time to open our tool box of riding skills and use the proper implement to get the task done safely. We could theorize this to death, but that is not the way I am going to do it here. 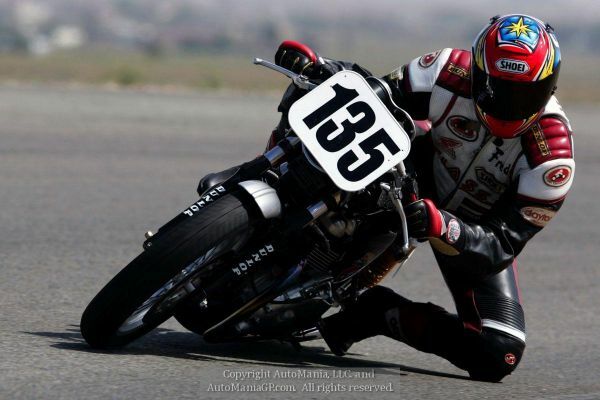 Actions speak louder than words as well as my thousands of laps, the thousands of laps run by racers and the thousands of street miles run by successful and safe riders is the best proof of what I feel to be the most effective method of maintaining the safe and efficient control of your motorcycle. How can it get lower than through weighting your feet on the pegs? Hanging under the motorcycle? Hmmm, that would be a sight! Let’s not get all extreme here, I am not suggesting that you stand on the pegs and balance yourself while riding, but bringing practicality to the subject by using reasonable body positioning can go a long way towards creating a more ideal riding condition. Next they lower themselves until just touching the seat, about 60% of their total weight still on the pegs, the rest on the saddle. Hurts a bit doesn’t it? The calves and feet will be worked, so be prepared for some muscle aches when the day is over until you get used to this (again, this is for directional change, not freeway cruising or parking lots). It is now time to engage the handle bars.